The Solucar station in Spain harnesses the sun's rays to make power. Oct. 6, join VCS and the MV Film Society for Switch, a true highlight of our "Green on Screen" collaboration. For info on the film and our screening, see VCS site; to learn even more, visit the Switch Energy Project. Saturday, Sept 29, 9:00 am to 2:00 pm, Oak Bluffs. Many electronic devices and appliances contain toxic chemicals that can be harmful if not disposed of properly, not to mention that getting rid of them at the dump is expensive! Bring your burdensome junk to MV Community Services (across the street from the high school) this Saturday. Fees range from $1 - $30 and benefit MVCS. For more info, see website or call 508-693-7900. Wednesday mornings at Native Earth are Toddler Time, where toddlers and their adults can meet and play in a fun and unfettered environment. Suggested donation of $5. For more info call 508-645-3304 or see website. Fresh picked produce from local farms, flowers, delicious baked goods and prepared foods from Island kitchens and more. For more info, see website. Every Monday, Wednesday and Friday 10:00 to 11:30 a.m. at Felix Neck Wildlife Sanctuary, Edg. Meet creatures of the sea including crabs, whelks and scallops. Cost is $9 or $6 for Mass Audubon members; free for kids under three. For more info, call Felix Neck at 508-627-4850. 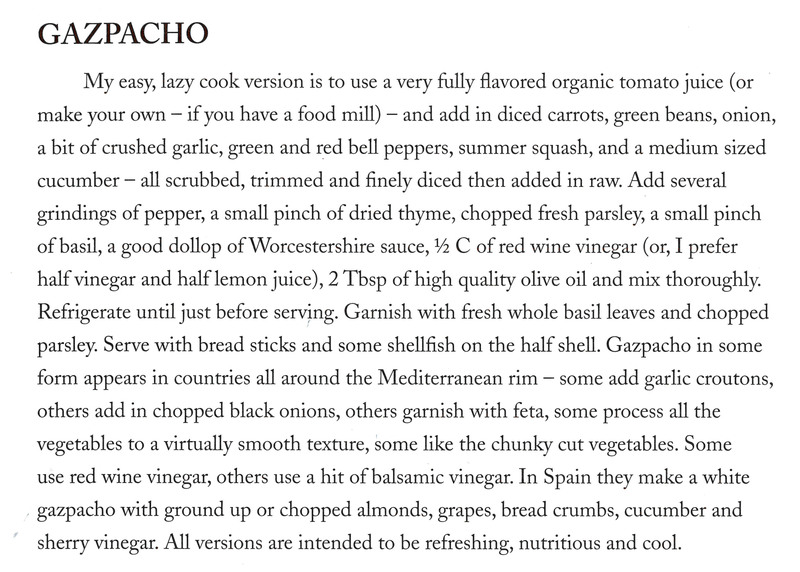 Gazpacho is often seen as the ideal summer soup, and for good reason - it's cool, fresh, and light. The thing is, though, tomatoes (the most important ingredient, by size at least), are precious in early to mid-summer, but piling up in the fields and pantries in late summer. Today, let's take a look at VCS Board member Ginny Jones' personal take on this diverse dish from her cookbook Fresh from the Vineyard. Join VCS at the annual Living Local Harvest Festival, Saturday September 29 at the Ag Hall in West Tisbury for free fun for all ages: fresh local food, live music (and animals! ), interactive educational demos, and classic harvest fest games and activities. (Skillet toss? Why not. Pumpkin-launching trebuchet? Of course!) 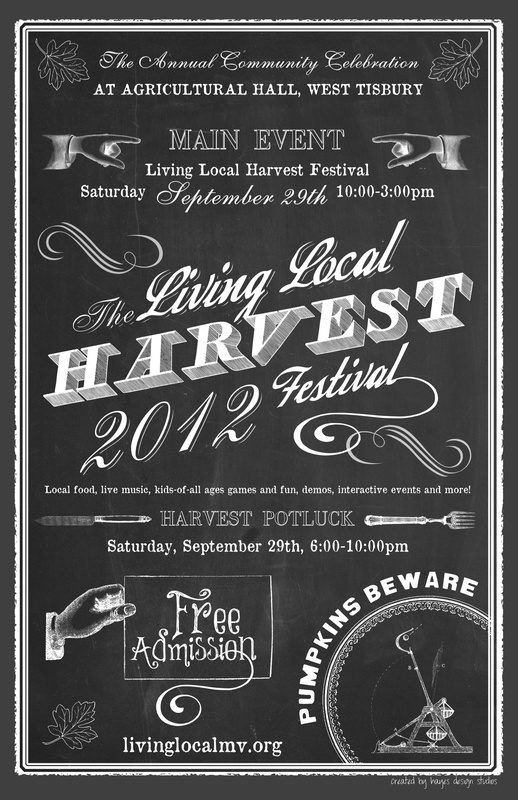 The festival and activities run from 10 am to 3 pm, followed by a harvest potluck from 7 to 10 pm. The Living Local Harvest Fest was founded by four Island organizations -- VCS, the MV Agricultural Society, the Vineyard Energy Project, and Island Grown Initiative -- to promote sustainable living on our Island by encouraging local food production and local economics, renewable energy, and resource conservation. Part eight of Liz Durkee's series on the local impacts of global climate change looks at wetlands -- both the expected impacts to wetlands from climate change, but also the important ecological functions performed by wetlands, some of which are crucial contributions to our island's resilience and adaptability to climate change. "Like sponges, salt marshes absorb storm water and thereby protect people, roads, and property from flooding and storm damage. They slow shoreline erosion, absorb pollutants, and recharge groundwater supplies." Butterfly watchers in Massachusetts have been noting more frequent occurrences of typically more southern species for some time. As reported by the NBC Nightly News last week, the science behind the story was interesting enough to produce a recent paper in the prestigious journal Nature. You can read more about the study, led by Greg Breed of Harvard Forest, at his project page. On a side note, one interesting aspect of the TV news segment was noted by VCS Board member Phil Henderson: Dr. Breed was actually allowed to answer the reporter's question, "Is this climate change?" with a cautious affirmative without the producers bringing in a climate skeptic for a soundbite to "balance" the claim. For the national network news, this is encouraging progress!